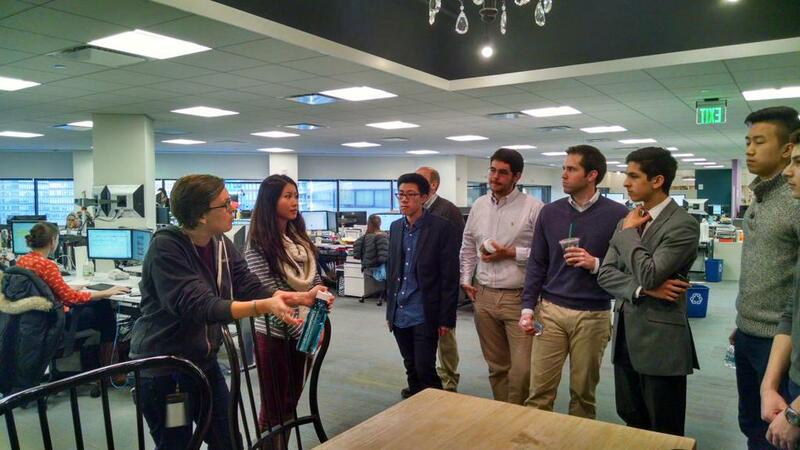 Last week, I was lucky enough to join BC’s Grad Tech Club on their visit to Wayfair. I was excited for the office visit for a few reasons. First, it was due to Wayfair’s unanimous rank as one of the best places to work for. Because of that, I have been keeping a keen eye on their job board for any potentially openings. I wanted to get a good sense for the culture and work environment before submitting an application. Prior to BC, I worked in a very early stage startup in San Francisco’s SOMA district at a shared workspace with several other startups. After working in an environment like that, it’s hard to me to think about going back to a strictly corporate office environment. Wayfair, although now a public company with thousands of employees, they have somehow managed to maintain the vibe of a startup. It was incredible walking around. They have maintained the culture and environment of their early days while growing into a billion dollar company. After our visit and seeing what they were about and what really drives them, I’m 100% going to apply for a job at Wayfair and would be thrilled at the opportunity to work there. Taking a tour of Wayfair’s offices with other members of the GradTech Club. At first glance, I wasn’t sure what to think of Wayfair. I certainly wouldn’t consider myself a home furnishings enthusiast, so was weary at the thought of working behind a product or business that I wasn’t sure I could get 100% behind. But we had a chance to sit down with BC alum David Aaron and his colleague Chris Roe who really broke down the business intelligence and data science that really gives them a competitive advantage. I saw, firsthand, that the passion David and Chris have is not necessarily for home furnishings, but rather for understanding and predicting user needs and behavior. They are 100% behind their work and their enthusiasm was obvious. Combined with their talent and that of the rest of the Wayfair crew, this passion for data is clearly what has driven Wayfair to be at the forefront of ecommerce analytics, giving them a clear competitive advantage. I’m thankful to Grad Tech for not only allowing me a sneak peek into working at such an awesome company, but also for giving a rare peak under the hood of a thriving company. 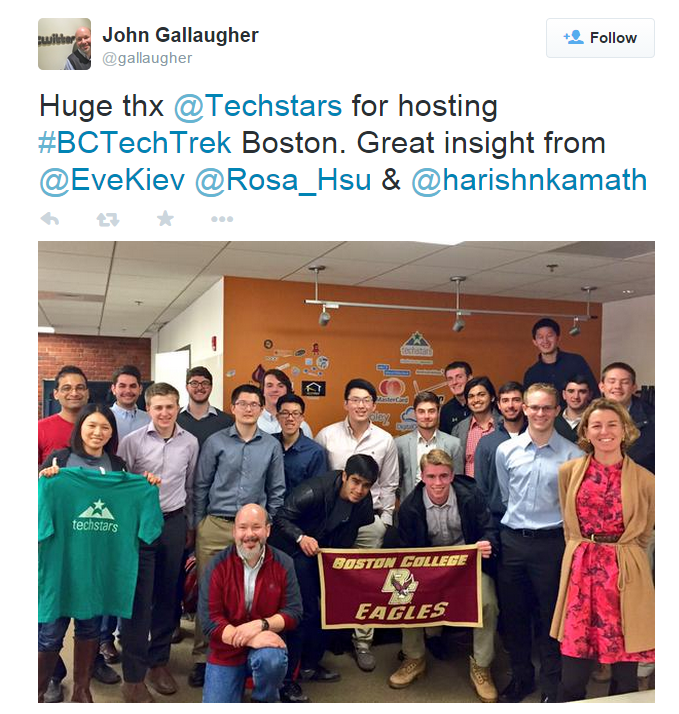 It’s a unique experience that we MBAs have access to, and I encourage others to take advantage of future BC Tech Club outings. It is with pride that I look back at the past semester for the Grad Tech Club. In less than four months, we have accomplished a ton, always toward furthering our mission of equipping our members with the knowledge and skills necessary for success in the tech industry, raising the overall profile of the BC MBA program within Tech, and getting our members hired! Toward the first goal of building hands on skills we have had several initiatives. Each Friday, MBAs led by GradTech VP Kori Kenerson, plug away at CodeAcademy’s Python course for Code & Coffee. Likewise, on Thursday evenings, the Product Team gets together to ideate, test, and release a real tech product. We are currently in the proof of concept phase with a few very interesting ideas. You can check out our progress here and here. Finally, each month we take on a new Digital Marketing Channel to explore its options. So far we have tried Facebook and Linkedin and we are currently exploring promoted tweets on Twitter. In addition to these, GradTech members are gaining html and web development skills from using WordPress and A/B marketing skills from experimenting with Mailchimp. We will continue these initiatives as we move forward so that BC MBAs won’t just graduate having done case analyses with hypothetical solutions but will also have applied the skills we learn to real tools and real products in the Technology space. Our biggest initiative to raise the profile of the MBA program in Tech has been our website and social programs. We do lots of cool things and then we blog, Facebook, and Tweet about them. From a previous best year of just over 200 visitors, we now get hundreds per month and we hope to break 1000 MAUs in 2015. Among our members we enjoy a sky high Net Promoter Score of 75 and we have had alumni express interest in getting involved, companies reach out to partner with us, and prospect students cite our club as one of the main reasons they are interested in BC for an MBA. All of these are indications that we are pushing forward but the biggest differences will come from placing our people in meaningful Tech jobs and helping out future Eagles. To that goal, we continue to push forward. We have attended job fairs and industry events put on by Microsoft, the Boston Product Management Association, and even sponsored the Startup Job Fair. We have visited the Cambridge offices or Microsoft and Facebook by ourselves and many more including Spotify and Paypal in conjunction with the Undergrad IS Academy through the TechTrek Boston program. Furthermore, on campus we hosted Alum Arnie Sookram from XBox and four MBA Alumni from Google, LogMeIn, Hubspot, and Wayfair to talk about the different careers and cultures within the Tech space. Well attended and highly praised, the Careers in Tech Panel has already led to a number of connections and we hope to hold a similar event featuring even more functional areas in the spring. Finally, we continue to drive alumni to help our cause through our Alumni Central and Hire an Eagle Page. We already know of some jobs coming out of these initiatives and we hope for many more. As we move into the spring we will continue to move forward towards the three pillars of our mission. Off campus we will visit as many industry events, offices, and career fairs as we can, and on campus we will host another Careers in Tech Panel, an event on What Every Manager Needs to Know About IT, a discussion on Women in Tech, and a Digital Marketing Dinner. We will continue to develop our product and hope to host a rousing Launch Party in April. I thank you for all your support thus far and look forward to a fantastic 2015! Yesterday, several of our members had the incredible opportunity to join the Chief Executive’s Club of Boston to listen to IBM’s CEO and Chair Ginni Rometty share her thoughts on the current state of Industry transformation. These events are normally limited to the top executives in the Boston area so naturally we jumped at the chance when given the invite. What we didn’t know was that IBM would announce it’s tenth straight quarter of revenue decline and the divestment of its semiconductor manufacturing division just a couple days earlier, adding some serious energy to the event. While Mrs. Rometty would touch on these in the Q&A, she chose to keep the talk itself focused on overall trends relevant to the executives in the audience, the majority of whom worked in finance. The theme of Mrs. Rometty’s speech was simple, there is nothing new about disruption but what makes today different is that there is not one trend transforming business but three concurrently. Furthermore, while they sound like they are Tech Industry trends, they are infiltrating every industry with the potential to reorder them from top to bottom. It will be the companies that understand and embrace these that will be the winners. So what are the three trends? No surprise to Tech Club members here: Big Data, Cloud, and Engagement. 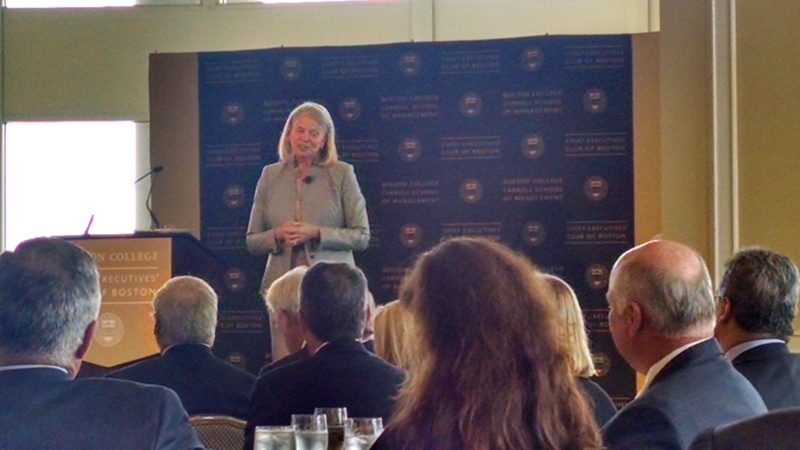 IBM CEO Ginni Rometty addressing the crowd. Big Data: Mrs. Rometty pointed out that neither data nor analytics are new to business but rather it is the type of data and analytics that is changing. Traditionally businesses have used descriptive or perhaps even predictive analytics. Mrs. Rometty compared these to navigation. Descriptive analytics can tell you what route is best to take based on past data. Predictive can give the best of several options based on data available at the time of the decision and what is expected to happen, but prescriptive is like a GPS that constantly adapts the route in real time according to a variety of constantly changing factors. Applying prescriptive analytics to business is not easy but Mrs. Rometty asserted that companies who succeed have 8% better retention, 10% higher share of wallet, and are 2.5 times faster to market than their competition. Mrs. Rometty urged the audience to use data as a weapon and suggested naming a Chief Data Officer as a good first step. Cloud: Mrs. Rometty began by informing the audience that while “Cloud” can be an ambiguous term the exact technology behind it is unimportant but what is crucial is understanding that the idea of “Anything as a Service” is transforming all industries. Business models are changing and the keys to winning are going to be speed and agility. Finding the right balance of on and off premise computing, software, and services will be the key to unlocking the competitive advantages innate in the next generation of business models. Mrs. Rometty reminded the crowd that its $7B of acquisitions make IBM the largest digital agency in the world and reaffirmed her commitment to helping IBM customers “reimagine the world”. Raise the security IQ of the internal team. 60% of all errors are internal, and 99% of those are accidental. It is crucial to train, test, and trick employees to accomplish this. Establish a permanent fast response team. Cyber attacks are a question of when, not if. Protect your crown jewels. Know what the true sources of value to your organization are and protect them from all angles. Make security a corporate priority governed by value not budget. “It’s not in the budget,” can never be a justification for leaving key assets vulnerable. Businesses should make the necessary trade-offs to ensure they are protected. While the overall tone was positive, one audience member did challenge Mrs. Rometty about the poor financial performance, particularly in the area of declining revenues. While she did not seem particularly happy about the question, she certainly was not unprepared. Mrs. Rometty emphasized her focus on rebuilding what’s underneath and offloading declining divisions. She pointed out that she had just offloaded not just $7B of revenue but also a half billion dollar loss. “We don’t need more revenue with empty calories,” she told the crowd, “what I do to add margin is much more important than revenue growth.” Instead, Mrs. Rometty highlighted IBM’s focus on shuffling IBM’s business mix to be much more focused on high growth areas. Jettisoning the disastrous Roadmap 2015 is certainly a step in the right direction but with the huge lead Amazon and Google have in the Cloud, and the speed and agility of start-ups in the Big Data space the road ahead for Big Blue will be difficult. Commercializing Watson and offloading the hardware divisions are good moves but it may be too little too late. Whatever happens, however, the opportunity to hear such an incredibly experienced and influential executive as Ginni Rometty is one for which we are truly grateful. Her observations on the changing business landscape are insightful and promising for our members who continue to strengthen skills in Big Data, the Cloud, and Social Engagement via our in class experiences and the hands-on opportunities the Grad Tech Club provides. 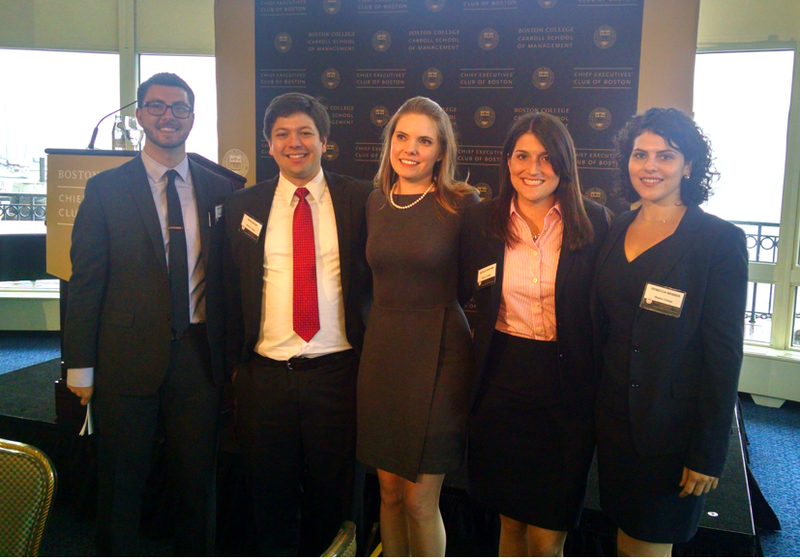 A huge thank you to the Chief Executive Club of Boston and our old friend (and former assistant Dean) Warren Zola!